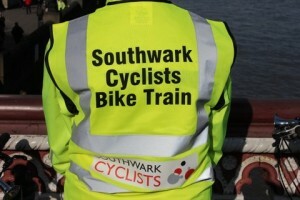 The Bike Train will start as usual at 8am from Nunhead Station picking up riders at Peckham Rye Station from the bike stands behind McDonalds at 8.10am. At the same time a train will leave Denmark Hill Station at 8.10 to join us in Burgess Park. We will be following our trusty backstreets route through two parks, a residential, traffic-calmed backstreet, the New Kent Road on-pavement cycle lanes, the E&C bypass and then the segregated cycle lanes up St George’s Road and Blackfriars Road to the bridge. From there Bike Buddies will take you on to Faringdon, Kings Cross and Mayfair. For other end destinations, just ask. Return Rides arranged personally. London Bridge/Tooley St: GO SLOW! !